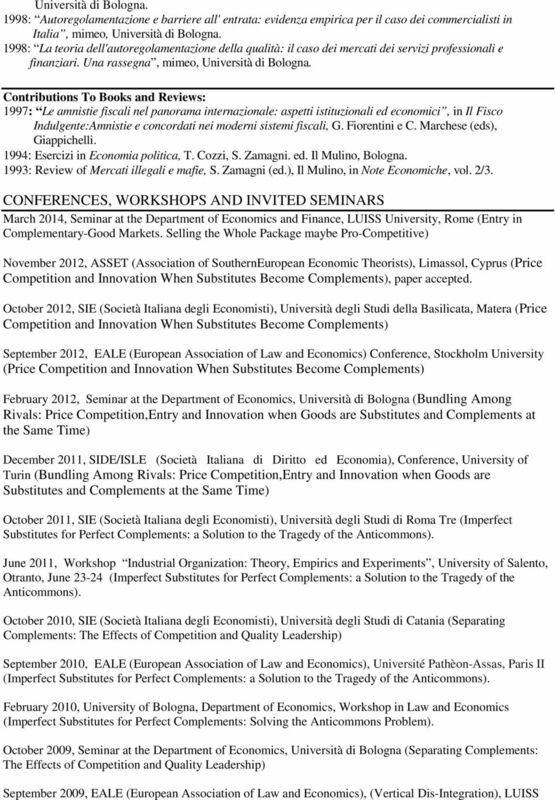 Download "CURRICULUM VITAE : MATTEO ALVISI"
4 University, Rome. February 2009, Seminar at the Department of Economics, Università di Bologna, (Concorrenza, Essenzialità e Esternalità di rete nella Produzione di Beni Complementari: nuove Soluzioni alla Tragedia degli Anticommons) November 2008: SIDE/ISLE (Società Italiana di Diritto ed Economia) Conference, University of Bologna (Complementing Substitutes). October 2008: MLEA (MidWest Law and Economics Association) Conference, Northwestern University, Chicago (Complementing Substitutes) January 2006 (particip. ): IV Workshop, SERPI. September 2005, The 4th EUROPAEUM Economic Workshop, Università di Bologna. October 2004, Società degli Economisti - SIE Conference, Ferrara. February 2003: University of Hamburg, Institute for Law and Economics. Workshop in Law and Economics (Piracy and Quality Choice in Monopolistic Markets). December 2002 (particip), Società degli Economisti - SIE Conference, Università di Bologna November 2002: ASSET Conference, Paphos (Cipro) (Piracy and Product Differentiation in the Market for Digital Goods) October 2002: Conference of the Società Italiana degli Economisti, Università di Ferrara (Piracy and Quality Choice in Monopolistic Markets). June 2002: Conference of the Society on Economic Research on Copyright Issues (SERCI), Madrid, Universidad Autonoma de Madrid (Piracy and Quality Choice in Monopolistic Markets). April 2002, Seminar at the Department of Economics, Università di Bologna (Piracy and Quality Choice in Monopolistic Markets) November 2001, Forum on Antitrust and Regulation, LUISS University, Rome. June 2001, Antitrust and Regulation - Workshop, Fondazione ENI Enrico Mattei, Milan. June 2000, Seminar at the Department of Economics, Università di Bologna (Quality Choice, Fixed Costs and Equilibrium in Models of Vertical Differentiation) May 1999, Seminar at the Department of Economics, University of California, Los Angeles (Quality Choice, Fixed Costs and Equilibrium in Models of Vertical Differentiation) June 1994, Summer School - CIDE (Centro Interuniversitario di Econometria), Bertinoro (FC), Italy Luglio 1993, (Organizing Committee), The Economics of Crime, International Conference, Department of Economics, Università di Bologna. REFEREEING Review of Law and Economics (Berkeley Electronic Press), Journal of Economics (Springer). 5 Appointed by MIUR as Referee for PRIN projects 2009 and ADMINISTRATION : Member of the Executive Committee of the Department of Economics, Università di Bologna : Member of the Student Orientation Committee, Faculty of Pol. Science, Università di Bologna. OTHER ACTIVITIES Education Consultant for Profingest Management School (Bologna) for the Master in Business Administration, a.y English-Italian Translator of textbooks, books and articles for the Publishing House Il Mulino, Bologna and the International Institute J. Maritain, Rome. Author of articles on economic issues of the Italian newspaper Il Resto del Carlino in the period LANGUAGES Italian (native), English (excellent), French (good), German. Born on October 30, 1967, in Rome Married to Silvia, with two children: Livia (7), and Penelope (5). ELENA ARGENTESI. 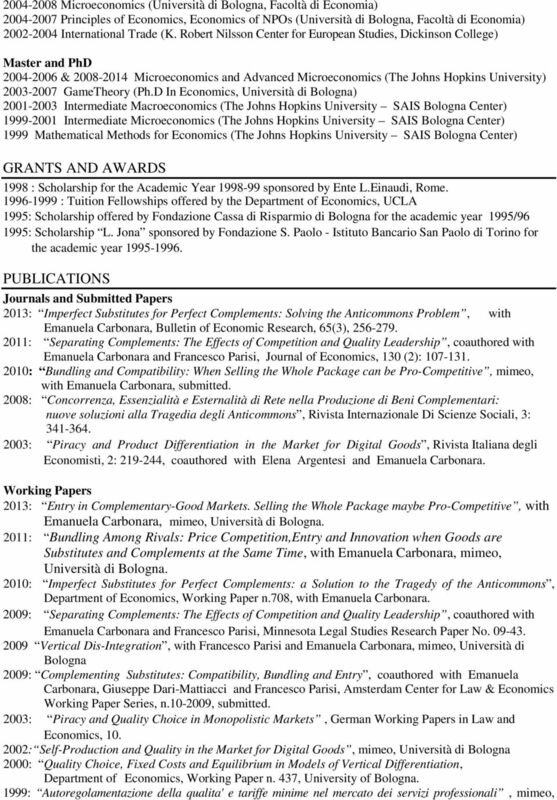 March Present: Assistant professor (with tenure since 2009), Department of Economics, University of Bologna. 1985: Visiting scholar, University of Virginia, Department of Economics, 1986: Visiting research fellow, Glasgow University, Department of Economics. Departamento de Economía Universidad Carlos III Tel. +34-91-624 9546 Calle Madrid 126 Fax +34-91-624 9875. http://www.eco.uc3m. CLAUDIO ROSSETTI Curriculum Vitæ. Place of birth: Rome, Italy. Date of birth: April 12, 1978. E-mail: claudio.rossetti.eu@gmail. VINCENZO GALASSO. Citizenship: Italian Place and Date of Birth: Napoli, 4/4/1967 Married to Paola, with one daughter Chiara. The Strategic Specialist and Imperfect Competition in a Limit Order Market, 2010, Journal of Banking and Finance, Volume 34, Issue 1, pages 255-266. Antonio Filippin. University of Milan, IZA. 20122 Milan (Italy) +39 02 50321505 (fax) http://www.antoniofilippin.net antonio.filippin@unimi. Current position (since 2004) Associate professor of Economics, Facoltà di Economia, Università Cattolica, Milano. 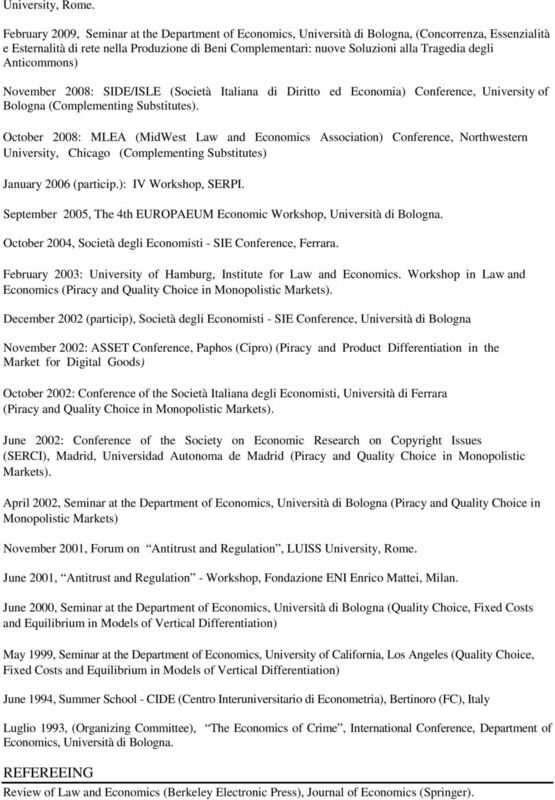 CURRICULUM VITAE ET STUDIORUM Bruno Chiarini Education -University of Roma (Laurea Degree, 1979/80); -University of Manchester (Master in Economics); -University of Southampton (U.K. Ph.D in Economics). Mel Marquis, Ph.D, J.D., LL.M, B.A. Elisabetta Morlino Curriculum vitae et studiorum Education: -2006-2009: Ph.D. Global Adminsitrative Law, Istituto Italiano di Scienze Umane (University of Rome La Sapienza -University of Florence) Ph.D. 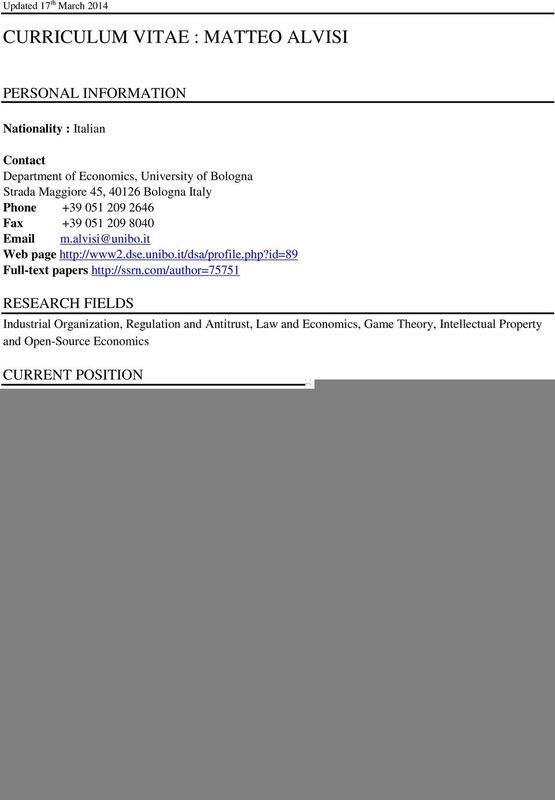 Associate Professor - Institute of Economics - Scuola Superiore Sant Anna, Pisa, Italy. Rue Lambert Le Begue, 21 4000, Liege, Belgium Italy e-mail : francesca.pancotto@gmail.com webpage : https ://mail.sssup.